As I write this, I am still reeling from excitement! We had just finished an epic 8-day road trip around the Czech Republic where we got to some pretty out of this world views. Prior to this trip, although we’ve been to the Czech Republic before, the extent of our trip is only to the city of Prague which is why we made it a priority to see the rest of the country. As we wanted a break from big cities, we mapped out a route that took us to some of the best places in the Czech Republic where we could enjoy the great outdoors. If you want to follow an itinerary filled with lots of hiking, biking, and exploring epic viewpoints, sit down, grab a cup of coffee (or a beer in anticipation of your trip) and start reading. 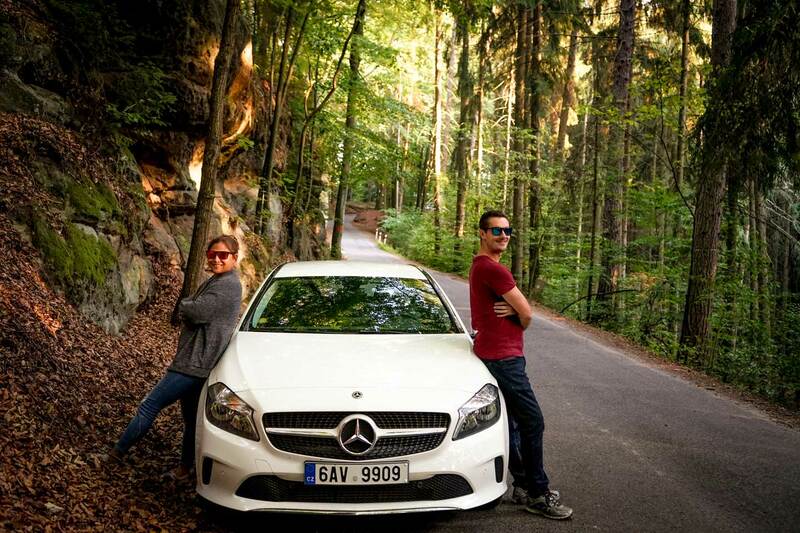 For this particular trip, we rented a car for eight days and drove around the country. However, it is worth noting that the Czech Republic is a small country and if you wanted, you could definitely cut your time short or make it longer depending on how much time you have. I have mapped out the route above and as you can see, and although the roads are beautiful, we wanted to spend more time exploring the outdoors rather than driving. This particular map takes you to all the places we stayed at during our trip but each accommodation were all in a pretty central location so if you didn’t want to stay there, there are tons of other options in the area. As mentioned, we opted to rent a car as we wanted to freedom to stop and take photos whenever we wanted to. Driving a car around the Czech Republic is easy as most of the roads are marked with signs. If you’ve never rented a car in a different country, it’s super easy and as soon as you get out of Prague, the roads are beautiful and very peaceful to drive in. We rented our car from Sixt which is conveniently located right by the main train station. After signing all the necessary paperwork, we were on our way! Renting a Car: When renting a car, you will, of course, need a valid drivers license, a passport or any valid ID to show, along with a credit card. Debit cards or cash payments aren’t allowed so make sure that you have all the necessary things to rent a car. If you’re coming from a country outside of the EU, you may need to show an International Driver’s Permit. If you are between the ages 21-23, you need to pay an extra fee, likewise, if you are over the age of 60, you might be asked to show a medical certificate. These rules vary per car rental company so it is best to check these things ahead of time. It is also worth noting that although the Czech Republic is a country that loves its beer…it is also the only country apart from Afghanistan that has ZERO tolerance for alcohol while driving. 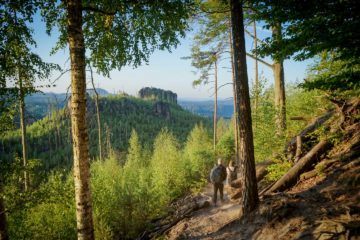 One of the good things about the itinerary we have is that once you get to your hotel, almost everything is within walking distance with the exception of the places in Bohemian Switzerland. The car below was our wheels for 8 days and was named Casper (the flying marshmallow) by our lovely Instagram followers. The roads throughout the trip were beautiful and if we weren’t driving through windy meadows, we were usually driving through forested areas which were beautiful. Where to Stay: We stayed in a hotel just outside of town called Aqua Park & Hotel Spindl. If you’re traveling as a family, its a great option as it has a wellness center and aqua park within the hotel grounds. If you want to stay a little bit closer to town, Hotel Grand is another good option. The drive from Prague to Špindlerův Mlýn was an easy two hours. The roads were nice and easy and although we were woried about driving within the city limits of Prague, another good thing about the location of Sixt car rental was within a couple of turns, we were already on the main highway. As soon as we got to Špindlerův Mlýn, we checked into our hotel and started exploring. If you’re an avid Winter sports fan and you happen to be in the area during Winter time, you’re in luck because this little town located in the Krkonoše Mountain Range is known for its big skiing and snowboarding scene. During our time there, we met up with someone who worked for Skia Skia Real who took us up the mountain Pláň via the chairlift. As soon as we got to the top, we followed a train and went downhill biking. The views from the top were incredible! Took these e-bikes up the cable car to see this view! 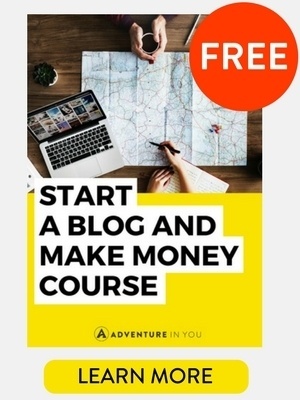 During our second day, we wanted to do some adventure stuff (we are an adventure travel blog after all) so we teamed up with a local company, Yellow Point. Offering a variety of things from hiking, biking, skiing, snowboarding, to a mini adventure park, we decided it was time to start exploring the many hiking trails around us. Although Špindlerův Mlýn is known as a Winter destination, it is still widely popular all year round. During our time there, there were loads of hikers who were like us, eager to explore the mountains. We started our day by taking the chairlift up to Medvědín Mountain. From the top, we were going to head to Labská Bouda where we could choose our trail going back down. Although we had a guide, all the trails were pretty clearly marked. There are also loads of information centers where you could stop in to help you find trails suitable to your taste. The trails were beautiful and were lined with stunning treetops and gorgeous ravines. It was nearing Autumn when we went so amidst the green treetops were these stunning orange and brown trees which added character and color to our photos. Most people hike up this way to see the Spring of River Elbe. This symbolic spot is the source of the River Elbe which spans across multiple countries in Europe. In fact, when you reach the spot, you can see various coats of arms of cities in which the river flows through. You can choose to extend your hike by choosing a longer trail going down or there are also a few shorter yet steeper trail options. 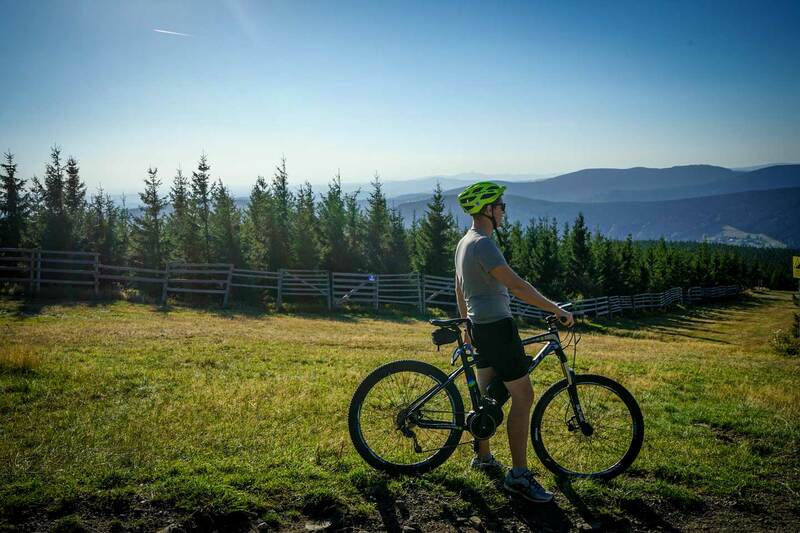 After hiking, you can opt to wander around the town of Špindlerův Mlýn or try out a few of the adventurous things in the adventure park of Yellow Point like their giant swing or downhill scooter riding. 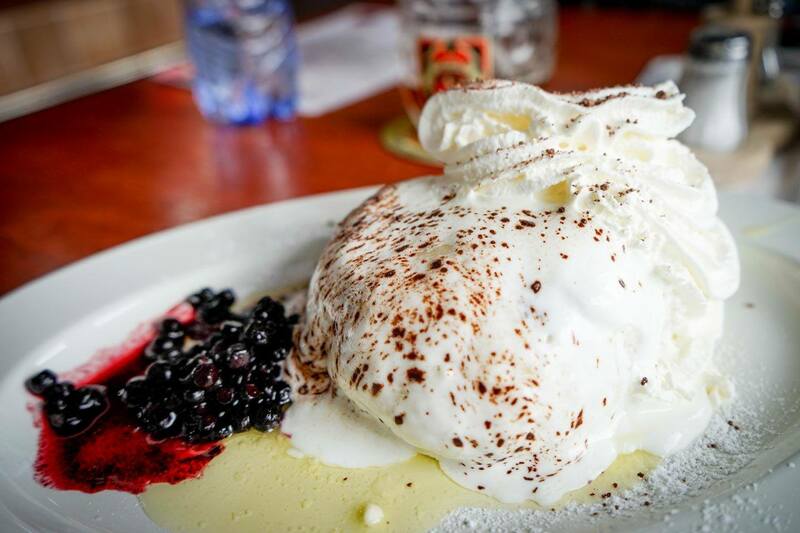 Our delicious blueberry dumpling from Labská Bouda. Where to Eat: If you’re up in the mountains, I definitely recommend checking out Labská Bouda. Don’t miss out on their beer PAROHÁČ which is made in their mini brewery. In town, you can check out Restaurace v Uličce. Their food was delicious! We also hung out with a few of the locals who worked at Yellow Point at a small local dive bar called Wifi Bar (ironically, they don’t have wifi). On day three, we woke up bright and early to drive to Farma Hucul to go horseback riding. When I was younger, I used to love horses so naturally, I jumped at the chance to do this. After a short drive, we soon found ourselves on a horse, riding through the misty forests around the area. Between the fog and the ominous mist gleaming from every bush and shrub, the entire experience was super magical. Even my partner Tom who isn’t usually fussed with horseback riding had a great time. From Farma Hucul, we stopped at Chata Tereza for lunch and boy, were we glad we did. This family-run mountain lodge served good home cooking and while it was located in what seems like the middle of nowhere, the food was delicious and top-quality. After lunch, we headed towards Rautis, a family run company that maintains the tradition of handmade Christmas decorations and glass beads. Apart from adventure, I love arts and crafts so the process of blowing glass beads and creating them into decorations fascinated me. 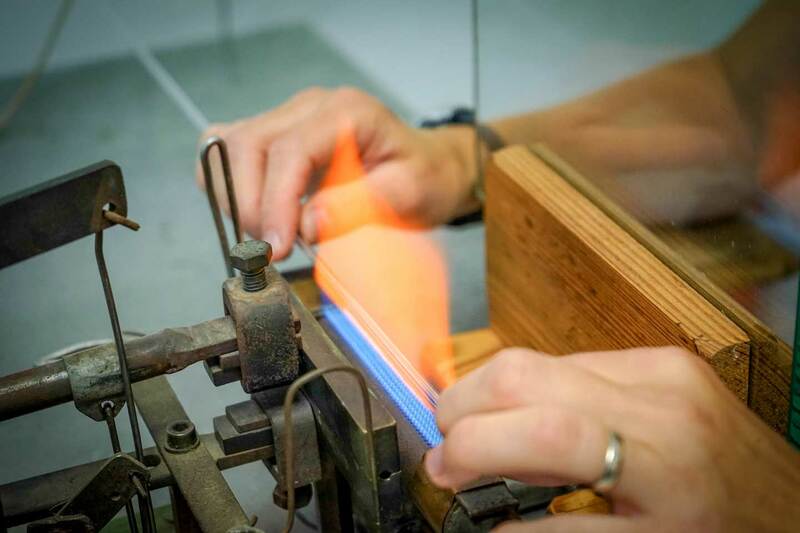 To date, the company is one of the only companies who still create these glass beads by hand. When you enter the shop, you can opt to purchase some handmade Christmas ornaments or even go on a mini-tour around the workshop. After our mini pitstop, we started making our way towards Bohemian Paradise. We first headed towards the ruins of Castle of Vranov. 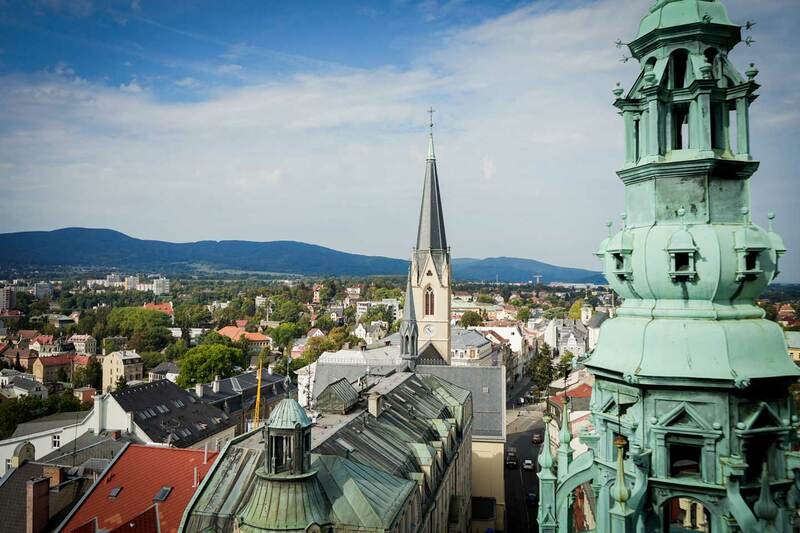 If you can get past the steep climbs and narrow staircases, you will be rewarded with stunning panoramic views of Bohemian Paradise. Tom wanted to have a go at rock climbing so we met up with a local guide who took us to one of the small sandstone rocks by Malá Skála. Rock climbing is quite popular in the area and quite understandably as there are loads of awesome rock formations to scale. For dinner, we headed to Hotel Restaurant Skála where we Tom claims he had the best svíčková (beef with cream sauce) ever. 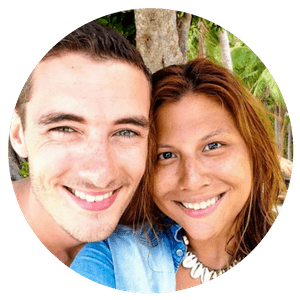 Where to Stay: Because we were going to explore the castles by Hruba Skala, we booked a room in Eu Chateau Hotel Hruba Skala. Although the rooms seemed quite dated, the fact that you can enjoy the castle grounds before the tourists get there is a huge bonus. Plus, who doesn’t want to say you stayed in a castle for a night? If you’re basing yourself in Turnov, we recommend staying at Hotel Karel IV. After a few days of no-stop activities, we decided to take it easy today. Hotel Hruba Skala has a wellness center so we decided to wake up early and spend the morning relaxing in the steam baths and sauna. By lunchtime, we were out and about ready to go exploring. At this point, we checked out of our hotel room and kept our bags in our car. There are various trails that you can follow but this particular one we wanted to do started at the hotel which was very convenient. We took the yellow trail through the nature reserve towards Castle Valdštejn then took the red trail heading back. The entire walk is well marked and labeled so getting lost is actually pretty hard. 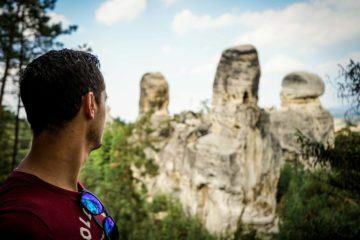 Along the way, you can see incredible viewpoints which show off the odd rock sandstone formations littered across the area. After we finished taking a gazillion photos, we headed towards the town of Turnov where we were spending the night. Viewpoints: Although the pathways are clearly marked, there are various viewpoints along the trail that are must stops! We saw a few people skip a few so make sure you look at all the signs. This website details a few of the viewpoints that you can see along the way. 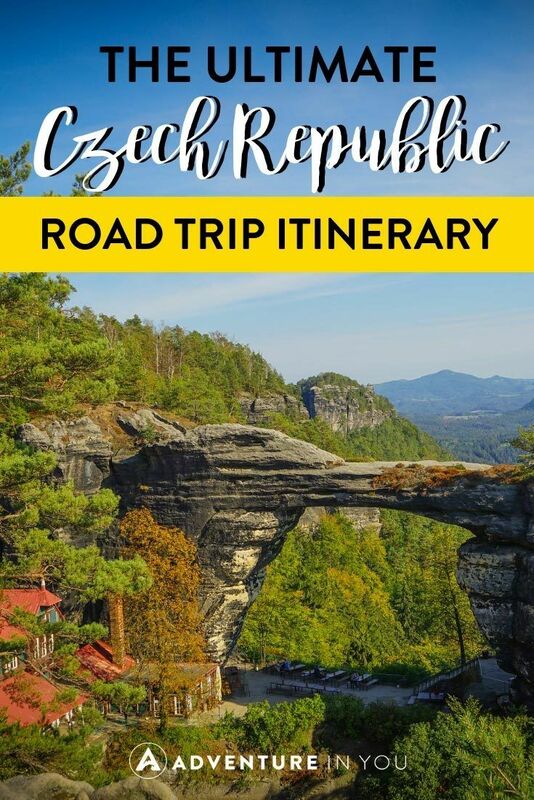 Editor’s Note: Take a look at out Places to Visit in the Czech Republic for a concise version of this itinerary including tips on what to do, where to eat, and where to stay. Now, this part of our trip is a bit funny as we actually decided to park our car in Decin, a town right by the foot of Bohemian National Park. 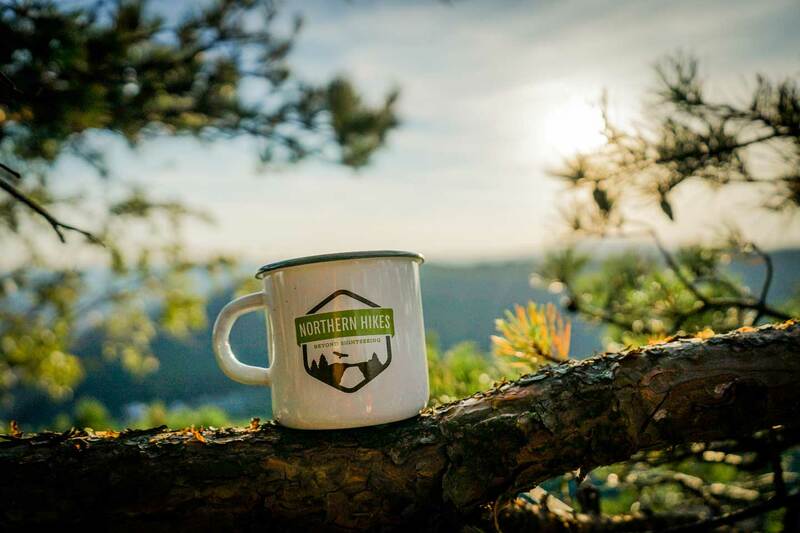 This was because we decided to explore Bohemian Switzerland National Park with the guys over at Northern Hikes. I have marked in the google maps some of the locations that we went to in case you want to visit them yourself. Although we have been seeing some incredible views, I don’t think anything could have prepared us for the beauty of Bohemian Switzerland. 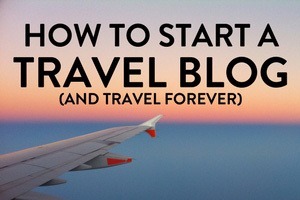 If you’re running short on time and can only go to one place in this list, this would be my top pick! 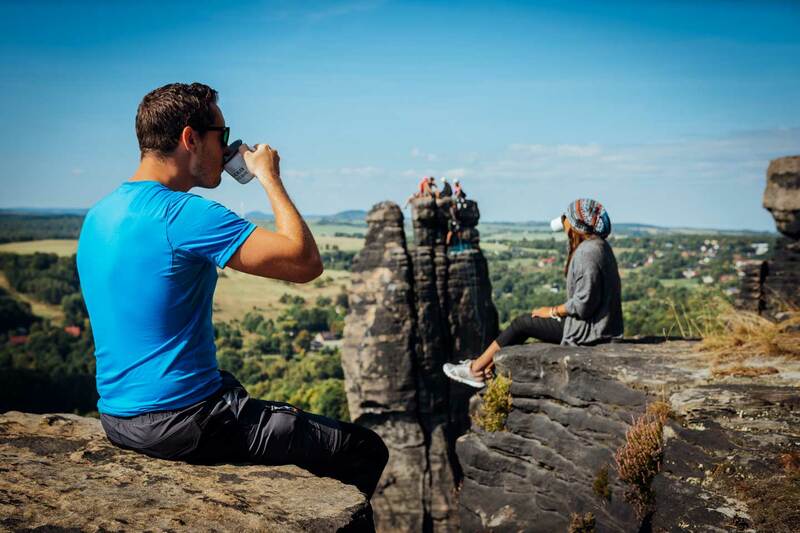 So as mentioned, we were adventuring with the guys over at Northern Hikes and our first port of call was to go on their newly launched Coffee and Canyons tour in collaboration with a local coffee shop, Bohemian Coffee House. This tour was created as part of their movement to fight over tourism in the national park. Instead of going to all the usual stops in the park, they teamed up with local explorers and Instagrammers (is that even a word?) to find the best viewpoints in the park. We started off our morning with a short hike to see the Pinnacle of the Doggenturm or Doga Rock. Here, we had our first coffee ritual where we sampled freshly ground coffee beans made in a portable Aeropress machine. When we got to the viewpoint, there were actually rock climbers scaling up the Doga Rock which just added to the overall beauty of the place. After lunch, we headed towards the famous Tisa Rocks. Now, even if you’ve never heard about this place before, chances are you’ve seen it because it is featured in the film, Chronicles of Narnia. On our next trip back to the Czech Republic (yes, we are already planning to return! ), we want to return during Winter Time as I can only imagine how magical these places look like covered in snow. For our afternoon session, we started hiking again, this time to reach Rose Ridge to see the largest sandstone canyon. The co-founder of Bohemian Coffee House, Mr. Jiri Duzar and his wife joined us for this tour and brought along some homemade strudel to enjoy with our sunset coffee. We hiked for a bit before reaching the viewpoint and as soon as we reached the ridge, the chatter ensued and soon, everyone was scrambling to grab their cameras. The view of the Elbe River was nothing short of stunning. We stayed until sunset and saw the sky turn from various shades of orange and pink. Naturally, to make our afternoon even better, we had yet again some freshly brewed coffee and pastries. Our day ended in Pivovar Falkenštejn, our brewery/hotel for the night. Although we got in quite late, don’t miss out on tasting a few of their local craft beers. Sustainable Travel: We chose to work with Northern Hikes as they are committed to promoting sustainable travel within the region. Northern Hikes is a locally owned company which began out of their love for their National Park. 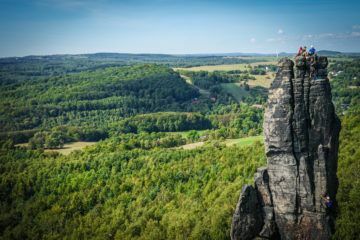 Most of the people who work for the company grew up in Bohemian Switzerland which is why everyone from the owner to the tour guides are passionate about what they do. 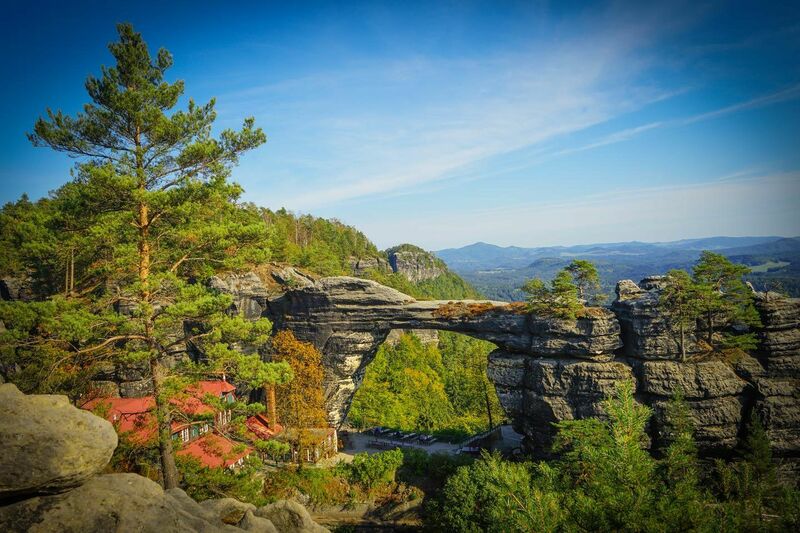 While they usually run day trip from Prague (Bohemian Switzerland is only a short drive away! ), you can also contact them to see if they can meet you in Decin, similar to what we did. 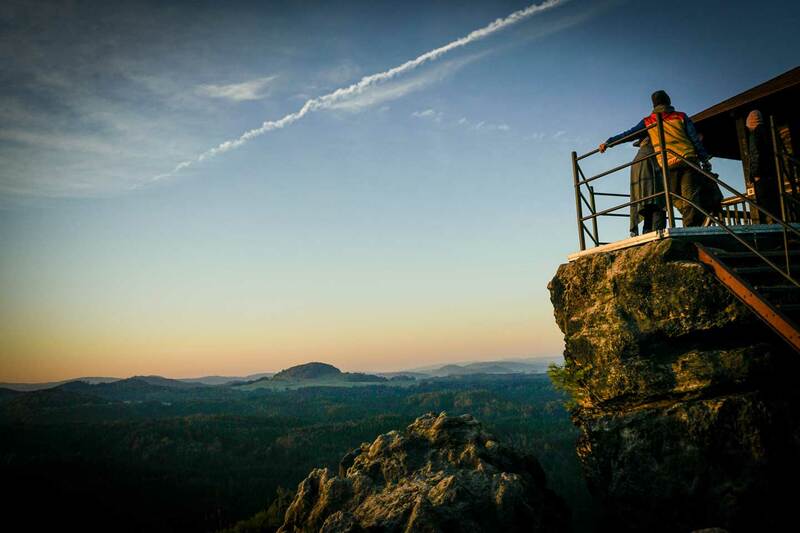 Check out our full review of our time in Bohemian Switzerland. We woke up at 5:40 am and sleepily made our way to the viewpoint at Mariina Skala. Although the climb was intense (when you’re stumbling in the dark and freezing, everything is hard). However, we knew there would be a fantastic viewpoint at the end so we braved the 600+ steps to get to the viewpoint. As usual, the guys from Northern Hikes came prepared and even had blankets and a snack bag for us to enjoy at the top. The sun was only starting to rise and it was still pretty dark when we arrived at the top. There is a small wooden hut where you can take shelter from the cold. So there we sat, huddled in blankets as we watched the sun slowly rise, illuminating the panoramic scenery before us. It was one of the most beautiful things we’ve seen in our trip so far. Suddenly, the fact that we woke up early and scaled this steep mountain didn’t matter as the view before us was worth every step! We wanted to see Kamenice Gorge before the crowds so right after our morning hike, we headed here. Although, if you are driving, it would make sense to do the gorge right after Pravcicka Gate. After a short hike, we got on a boat which would take us to the end of the gorges. Everything in that moment seemed like a scene from a movie. The sun glistening in the distance, the occasional bird swooping in for a dip, and lastly, the cheerful sound of our boatman’s harmonica as our boat glided through the water. After a jam-packed morning, we headed towards Lucni bar for a well-earned brunch! After all, we had been up since 5:40 am and were running off nothing but sheer excitement and a banana. Set amidst a peaceful meadow is this beautiful piece of land which was converted into a self-service restaurant. What once was a landfill is now home to a peaceful abode where travelers can come, relax, and enjoy the beautiful setting. The owners of the property were lovely and nothing short of welcoming! We grabbed a few (more like the entire container) of sausages to grill and set ourselves on the nearby picnic table where we began cooking our breakfast picnic style. As it was already nearing two at this point, we also grabbed a couple of bottles of beer (which were all from Falkenštejn Brewery). The entire concept was amazing and is something I wish I would see more of in the near future! After we gorged ourselves with bread, sausages, cheese, and beer, we simply listed what we consumed and left. A stop here is highly recommended. Our next stop was to visit one of the most iconic features of Bohemian Switzerland National Park which is the famous Pravcicka Gate. Known as the largest sandstone arch in Europe, this natural monument stands tall and is nothing short of impressive. We spent a few hours here taking photos and enjoying a well-deserved glass of cold beer under the arch! 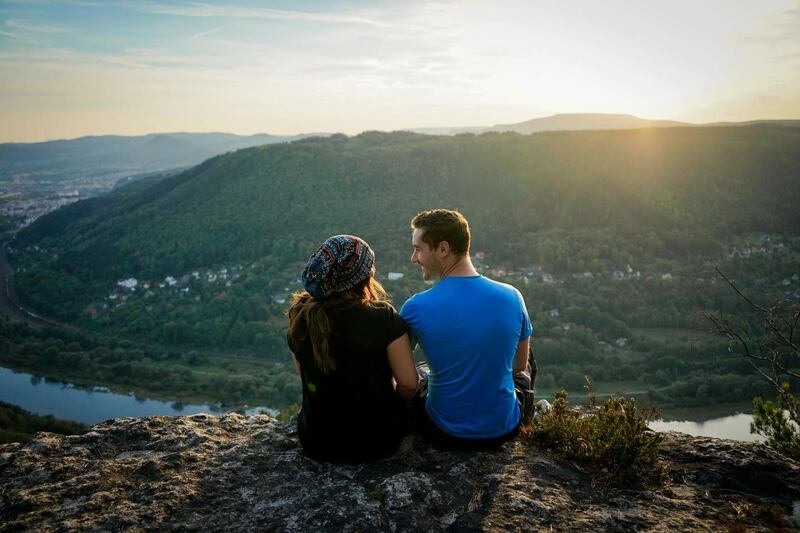 Where to Stay: During our time in Bohemian Switzerland, we stayed in two different places which we can recommend. The first was in Pivovar Falkenštejn which is both a brewery and a hotel. If you stay here, you MUST sample a few of their local brews as it is delicious! As mentioned, we also spent one night in Na Stodolci which is listed as The Barn Inn on Google Maps. After spending the last 6 days exploring national parks and other epic sceneries, we headed to Liberec, a small city which is located just an hour away. As public transportation in Liberec is amazing, once you reach your hotel, you can just park the car and explore the city by foot or tram. Although we loved being outdoors and really enjoyed all the hiking that we did, we were excited to try all the bistros and gastropubs in Liberec that we’ve been hearing all about. During our two days there, we had brunch at Bistro Mikyna and Bistro Široká and had evening meals at Beerwarehouse and Zoo 1320. Although Liberec is a small city, it makes up for it in character and charm. On our first day, we went up the Ještěd Mountain where Tom went on yet another hiking adventure. I opted to sit by the TV tower/restaurant as, by this point, my ankle was aching after all the hiking we’ve been doing. I broke my ankle in 3 places a few months prior to this trip and have a metal rod and 11 screws holding my foot together so I decided to listen to my body and just chill out. The iconic tower is a trademark of Liberec and is one of the best places to really enjoy a panoramic view of the entire city. We stayed in Pension u Muzea and fully enjoyed their wellness center! After 6 days of non-stop hiking, the steam and sauna rooms felt like it was sent from heaven. It was the last day of our road trip but before we ended our time in Liberec, Tom wanted to have a go at the via-feratta wall located right in the heart of the city. Located right in the heart of the city, a group of climbing enthusiasts turned an old dumpster site into a climbing center where people can come together and enjoy the outdoors. During the Winter time, it also becomes an ice climbing arena. After spending a couple of hours climbing, we hung around the area and had a mini picnic with the local climbers which was awesome. After wandering around the city of Liberec (whose architecture is beautiful by the way), we began our journey back to Prague. Although Liberec is only an hour and a half away, if you travel during peak rush hour, the traffic can be bad so I suggest you factor this in your time frame. 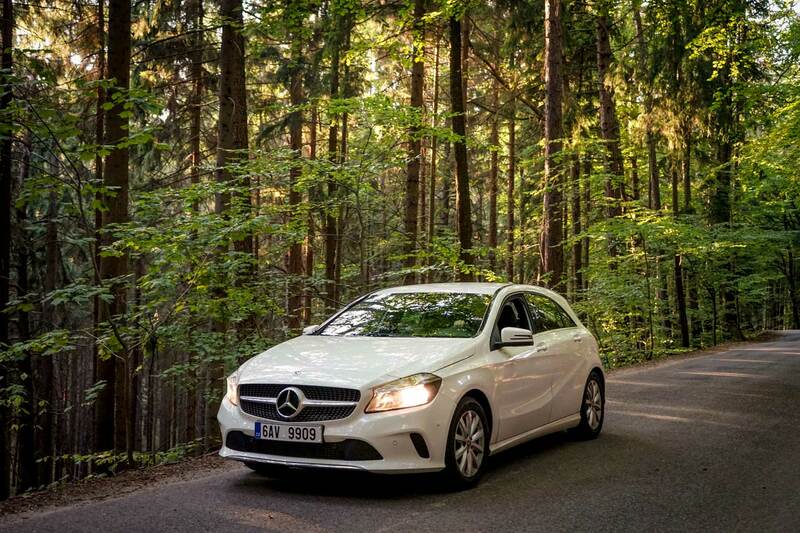 The drive back to the city wasn’t too manic and within a few hours, we were returning Casper back to Sixt station. 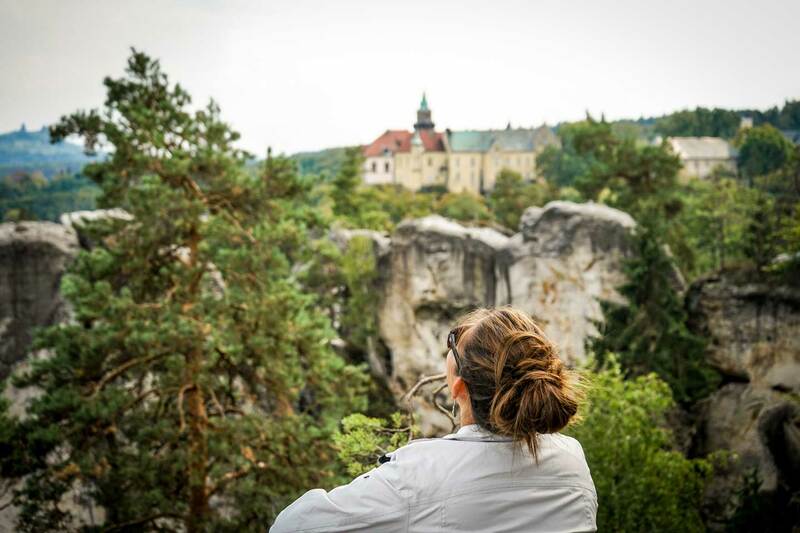 Although we were sad to return our car, we’re SO happy that we took the time to explore more of the Czech Republic. The countryside had pleasantly surprised us and even blew us away in terms of landscape and scenery! If you have any questions about this itinerary, feel free to comment below or to send us a message. I will be more than happy to answer any questions that you might have about this trip. Before I end, here are a few roadside reminders and important Czech Words for you to remember. Petrol and Parking: We were amazed that we had only used one full tank of petrol during our entire trip (however, do note that we didn’t drive our car in Bohemian Switzerland. This meant that during the entire trip, we had only spent around €60-70 which was definitely half of what we budgeted for. For the most part, we also never had to pay for parking as most of the establishments that we stayed at had free parking spaces. Just double check with the front desk before you leave your car there for the night. 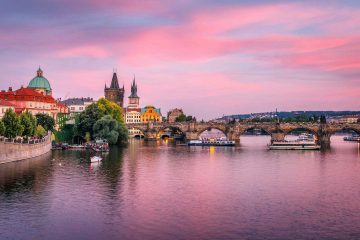 Hopefully, this itinerary has inspired you to venture further than Prague when visiting the Czech Republic. Between its affordable prices, incredible natural sights, and amazing beer- what’s not there to love? 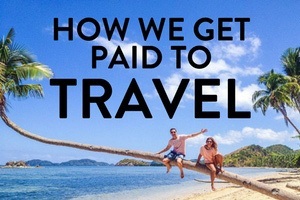 Note: This article was written in partnership with Visit Czech Republic, however, as usual, all words and opinions are ours!